High-growth startup companies live and die by their ability to power Reinforcing Loops for growth. The loop might be for number of users (Facebook), number of reviews (Yelp), number of hosts (AirBnB), number of contributors (Wikipedia), or number of drivers (Uber). If they can’t grow these, they won’t make money. And if they run out of money before they can convince more investors to sign on, then they fail. There’s something unique about the platforms listed above – each of them would not have been successful without a certain minimum level of adoption within a community. You would not have used Facebook if none of your friends were on it. You wouldn’t order a car using the Uber app if your city rarely had drivers available within 20 minutes of your current location. In other words, having a Network was part of the product’s value. 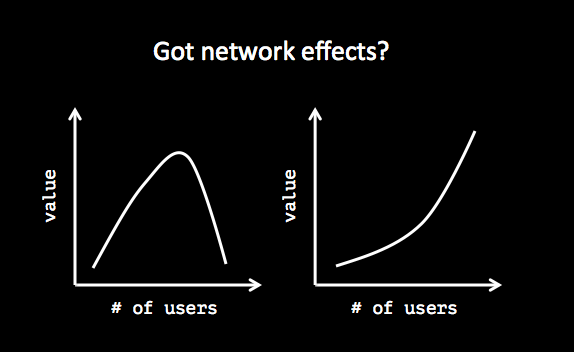 “Network Effect” applies to an ecosystem where the value of the product or service increases as the number of users grows. The more apps there are on the iPhone, the more valuable the iPhone becomes. Outside of technology, language adoption also depends on network effects. English is a global language, so it should come as no surprise that more people are likely to pick up English as a second language than a language like Taiwanese. You might wonder, doesn’t everything get better with more users? Not necessarily. Your driving experience gets worse the more cars there are sharing the highway. The school learning experience gets worse when more students are added to the classroom. Business meetings can have too many cooks in the kitchen. Gmail as a pure email service does not have network effects because a gmail user can still email a yahoo or hotmail user. But Gmail users are part of the greater Google ecosystem which includes google chat, google drive, google hangouts, even Youtube. So Google has integrated users who originally signed up for email services into its larger platform, which does experience network effects. But when network effects exist, you choose the platform because of its network. I look books up on Goodreads before purchasing on Amazon because I trust Goodreads’s user base and their more nuanced rating system when reviewing books. You might choose your smartphone, video game console, or online reviews site based on the size of their existing user base. So what creates Network Effects? You need three core things – Community, Empowerment, and Norms. First, you need a community that wants to engage in a product or service because it brings them some sort of value. But you also need to empower that community to think for themselves and share those opinions. Network effects work only when there is the belief that the community’s values and voices matter – a bottom-up ecosystem. Finally, the platform must have some sort of norms so that its users understand how to participate and derive value from the product. On Twitter, people understand the 140-character limit and the use of hashtags. Uber users know they can give a 1-5 star rating to each driver. These norms help moderate interactions so that participants get the most out of their experience. And finally, once network effects are in place, it becomes easier for the product or service to grow – word of mouth referrals serve as powerful Reinforcing Loops. Wikipedia’s content is created and edited by its millions of users, creating a much larger knowledge base and task force than Encyclopedia Britannica. More recently, StackExchange and Quora are platforms designed for people to ask and answer questions for each other. Once network effects are in place, it’s very difficult for a second market entrant to usurp an existing community due to switching costs. This is because customers have already invested time to understand, cultivate, and store information in their existing community of choice. But a new company that creates a superior product can present a compelling reason to switch. Myspace enjoyed significant network effects at first but over time saw its quality decline as users were given too much freedom to glamorize their profiles. Facebook then convinced college-age users to switch over and rebuild their networks on its significantly better product with a cleaner interface and clearer vision. Not even network effects can save you from this monstrosity of a MySpace profile. Apple lowered the switching costs from Windows to OSX by increasing compatibility, streamlining the migration process from Windows, and building a brand that signaled innovation and imagination. Simultaneously, Apple raised the switching costs of switching from Apple products by building an integrated ecosystem of products that locked in loyalists. Think about all your favorite products and services. Do these experience Network Effects? If not, what would it take and look like with Network Effects? Do you see Network Effects in schools? Hospitals? Public Transportation?